Why Get Your Air Ducts Cleaned? Some occupants are more sensitive to these contaminants than others. Allergy and asthma sufferers, as well as young children and the elderly, tend to be more susceptible to the types of poor indoor air quality that air duct cleaning can help to address. You can tell if your heating, ventilation and air conditioning (HVAC) system needs cleaning by doing the following: First, with a screwdriver, remove a floor or wall register. 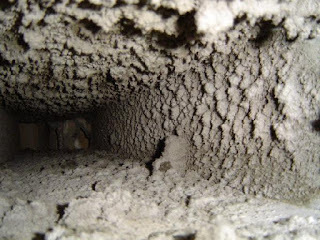 If there is visible dust, dirt or debris, you should have your ducts cleaned. There are two key components to HVAC cleaning: Breaking contaminants loose, and collection of contaminants. Properly cleaning HVAC systems requires removing the sources of contamination. Source removal begins with use of one or more agitation devices designed to loosen contaminants from the surfaces within the heating and air-conditioning system. Examples of agitation devices include brushes, air whips and compressed air nozzles. Agitation can also be achieved through hand-brushing or contact vacuuming. During cleaning, the entire HVAC system is placed under continuous negative pressure or HEPA-Filtered vacuum to prevent the spread of contaminants. Continuous negative pressure and HEPA vacuuming allows very fine particles to be removed from the system as they become airborne, ensuring that these particles are not released in to the living space when the system is turned on after cleaning. This negative pressure and HEPA vacuuming also serves to extract the loosened contaminants, which are collected and removed from your home. HVAC system cleaning is not a complex process, but each job is unique. Where possible, access to duct interiors should be made through existing openings such as supply diffusers, return grills, duct end caps and existing service openings. Cleaning technicians may need to cut access holes in the duct work in order to reach inside with various cleaning tools. Creation of these service openings, and their subsequent closure, requires craftsmanship and professional skill. Antimicrobial treatments include sanitizers, disinfectants and deodorizers can be applied to non-porous surfaces in HVAC systems to address microbial contamination and help control odors. Only solutions registered with the United States Environmental Protection Agency (EPA) can be used. These products should only be considered after mechanical surface cleaning has been performed and if the need for such a treatment has been deemed necessary. Get good filter. Ask your GreenPro Cleaning & Restoration technician for a recommendation. Even with properly cleaning and changing quality filters, the HVAC system will still become dirty over time. Have your system inspected every two years to determine whether your system needs to be cleaned again. There are several factors that affect cost and time estimates: type of ductwork, size of system, system accessibility, the number of crew members, level of contamination, and even microbial factors. The national average for properly cleaning an HVAC system in an average-sized home may cost upward of four hundred fifty to one thousand US dollars according to the United States Environmental Protection Agency (EPA).